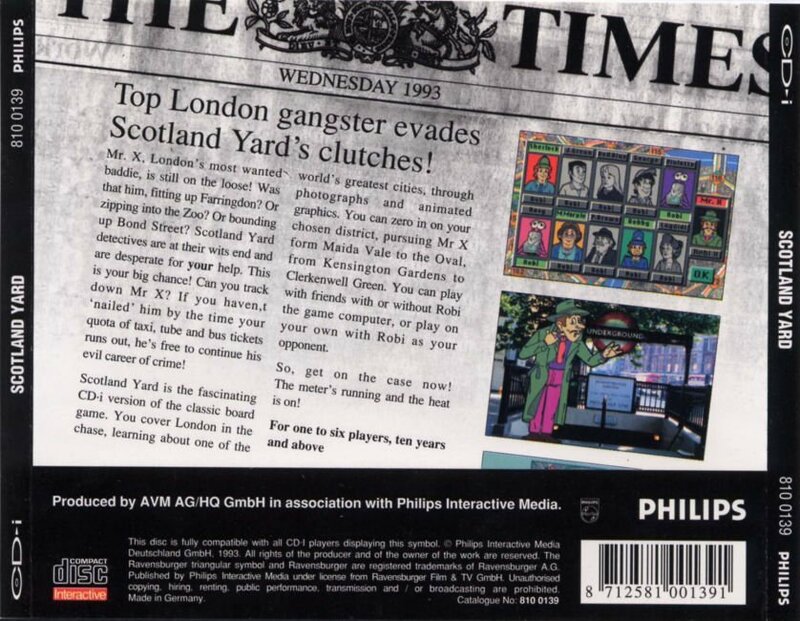 UK based AVM AG/HQ delivered Scotland Yard Interactive on CD-i in 1993 before they went on developing Master Labyrinth on CD-i, both licensed Ravensburger projects which, just like MB, made a deal with Philips to support the new CD-i format. 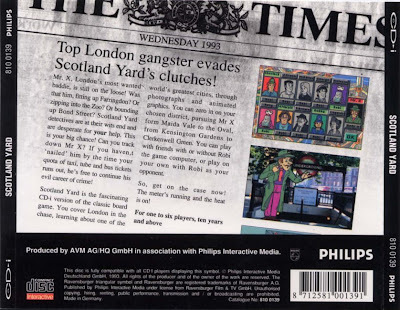 Scotland Yard however was only published in the United Kingdom so in the end it is a very rare CD-i game to get hold of. 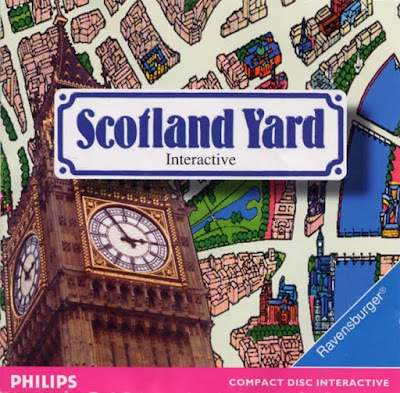 Very few people have played it on CD-i (Don't confuse it with the multiplatform Scotland Yard game made by Cryo in 1998). it is based on the popular board game. You can play two modes, either ''classic'' or ''London Special''. You also have a multiplayer option. If playing by yourself, the aim of the game is to catch Robi X by using various modes of transport around London. You can play as various characters, for example Miss Marple, Sherlock Holmes and the game features plenty of still images from London. From the box: "Mr. X, London's most wanted baddie, is still on the loose! Was that him, fitting up Farringdon? Or sipping into the Zoo? Or bounding up Bond Street? Scotland Yard detectives are at their wits end and are desperate for your help. This is your big chance! Can you track down Mr. X? If you haven't 'nailed' him by the time your quota of taxi, tube and bus tickets runs out, he's free to continue his evil career of crime! Scotland Yard is the fascinating CD-i version of the classic board game. You cover London in the chase, learning about one of the world's greatest cities, through photographs and animated graphics. You can zero in on your chosen disctrict, pursuing Mr. X from Maida Vale to the Oval, from Kensington Gardens to Clerkenwell Green. You can play with friends, with or without Robi the game computer, or play on your own with Robi as your opponent. So get on the case now. The meter's running and the heat is on!" 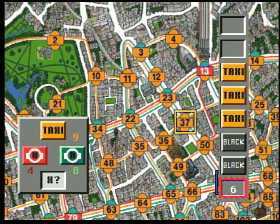 In Scotland Yard Interactive by AVM AG HQ GmbH and Philips Interactive Entertainment, One player takes the part of Mr. X and slinks around the city, leaving clues for the others who are the Scotland Yard detective team. Was the elusive Mr. X last seen at Buckingham Palace or Madame Tussaud’s? Did he travel by bus or taxi? Strategy skills and teamwork will help Scotland Yard players trap Mr. X and win the game. If, on the other hand, Mr. X manages to escape capture, he wins! The main map is in 2D and is very much like the board game. It shows more than 100 stations in the city that can be reached by taxi, bus or underground. Each type of transportation costs you a ticket. One player takes the part of Mr. X and goes around the city, leaving clues for the others, who are the Scotland Yard detective team. If Mr. X manages to escape, he wins. The detectives have to plan different routes to surround Mr. X and try to cut off his lines to escape. To make things difficult for the detectives, they only have a limited number of tickets, and when they run out of a ticket type, they cannot use that mode of transport anymore. The CD-i version is a nice recreation of the board game and requires strategic planning. It is one of the few (perhaps the only) CD-i games that you can play with 6 (!) players. You can play either as Mr. X or detective, solo against the computer or with friends. It has to be said the CD-i game is a bit slow in places and will require a few seconds loading time between every turn. When you play against the computer you'll quickly find the same routes and hints all over again, and it's definitily more fun to play with 5 other friends. I've been looking for info on this game. Thanks for posting.